Clicking on any Carved Santa link will open a new window, allowing you to see a bigger picture & find out more information about the carved Santa. Purchases may be made on that page via PayPal. To return to this page just close the new window or click the return link. All of Tom's Santas are carved in the round unless otherwise stated. Next Day Delivery Option is available. go back to see the Santa Carvings on Page 2. 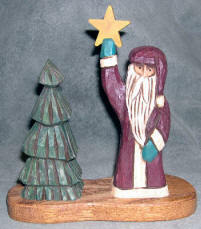 See our Pencil Santa Carvings on Page 4.